Carnival Corporation & plc (NYSE/LSE: CCL; NYSE: CUK) has announced U.S. GAAP net income of $336 million, or $0.48 diluted EPS, for the first quarter of 2019, compared to U.S. GAAP net income for the first quarter of 2018 of $391 million, or $0.54 diluted EPS. First quarter 2019 adjusted net income of $338 million, or $0.49 adjusted EPS, compared to adjusted net income of $375 million, or $0.52 adjusted EPS, for the first quarter of 2018. Adjusted net income excludes net charges of $2 million for the first quarter of 2019 and net gains of $16 million for the first quarter of 2018 relating to unrealized gains on fuel derivatives net of other charges. Revenues for the first quarter of 2019 were $4.7 billion, higher than the $4.2 billion in the prior year. Key information for the first quarter of 2019 compared to the first quarter of 2018: Gross cruise revenues of $4.6 billion compared to $4.2 billion for the prior year. In constant currency, net cruise revenues of $3.6 billion compared to $3.4 billion, an increase of 4.7 percent. Gross revenue yields (revenue per available lower berth day or “ALBD”) increased 5.8 percent. In constant currency, net revenue yields increased 0.5 percent, better than December guidance of approximately flat. Gross cruise costs including fuel per ALBD increased 8.6 percent. In constant currency, net cruise costs excluding fuel per ALBD increased 0.9 percent, better than December guidance of up approximately 2.0 percent, mainly due to the timing of expenses between quarters. Changes in fuel prices and currency exchange rates decreased earnings by $0.03 per share. Highlights from the first quarter included the delivery of AIDAnova, the first cruise ship in the industry powered at sea by LNG and the delivery of Costa Venezia, the first Costa ship designed for the Chinese market. Princess Cruises expanded its MedallionClass experience onboard Regal Princess, with three additional ships to follow in 2019. 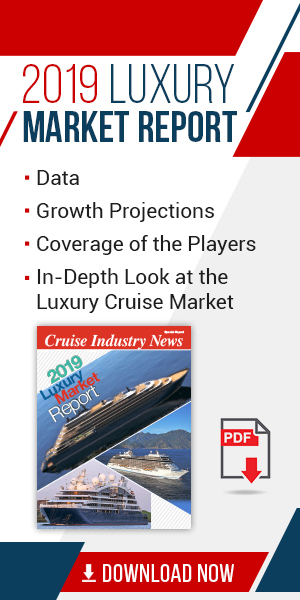 Based on current booking trends, the company continues to expect full year 2019 constant currency net cruise revenues to be up approximately 5.5 percent, with capacity growth of 4.6 percent, and net revenue yields in constant currency expected to be up approximately 1.0 percent compared to the prior year driven by our NAA brands. The company continues to expect full year net cruise costs excluding fuel per ALBD in constant currency to be up approximately 0.5 percent compared to the prior year. Taking the above factors into consideration, the company expects full year 2019 adjusted earnings per share to be in the range of $4.35 to $4.55, compared to December guidance of $4.50 to $4.80, due to changes in fuel price and currency exchange rates and 2018 adjusted earnings per share of $4.26. Donald commented, “We believe we are on a path that includes delivering, over time, double-digit earnings growth and improving return on invested capital through a consistent strategy of creating demand in excess of measured capacity growth while leveraging our industry leading scale.” The company invested more than $250 million in share repurchases during the quarter, bringing the cumulative total to nearly $5 billion since late 2015. Second quarter constant currency net revenue yields are expected to be in line with the prior year. Net cruise costs excluding fuel per ALBD in constant currency for the second quarter are expected to be up approximately 1.0 percent compared to the prior year. Changes in fuel prices and currency exchange rates are expected to decrease earnings by $0.08 per share compared to the prior year. Based on the above factors, the company expects adjusted earnings per share for the second quarter 2019 to be in the range of $0.56 to $0.60 versus 2018 adjusted earnings per share of $0.68.